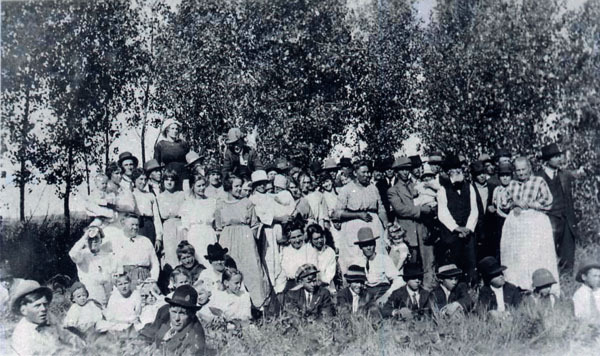 The Peoples Society of the Ridgeway Lutheran Church, 1916, on the Sam Vaagen farm, adjacent to the Ridgeway Lutheran Church original site. The Peoples Society of the Ridgeway Lutheran Church was organized in 1911 at the home of Nels Engebritson for the purpose of raising funds for building a church. Members of the society were pioneers who first settled in the area north of Taylor, North Dakota. 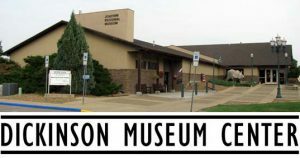 They included Iver Engebritson, Henry H. Myran, Andrew Aasgard, Sam Vaagen, John Myran and John Gunwall who all came from Ridgeway, Iowa in 1886-1887 and Erland Paulson from Minnesota who settled first in Taylor in 1884 and later in Ridgeway in 1894. Prior to starting the Ridgeway Lutheran Church, most of these settlers were members of the Taylor Lutheran Church. The land of the original church and cemetery site, located about 13 miles north of Taylor, ND in Dunn County, was donated by Sam Vaagen and Iver Engebritson. The cemetery was dedicated on October 12, 1913 and the cornerstone for the Ridgeway Lutheran Church was laid on July 22,1915. The altar, altar railings and pulpit in the church were all gifts to the Ridgeway Lutheran Church from the Lincoln Congregation in Winneshiek County, Iowa. Many members of the Ridgeway Lutheran Church had been members of that congregation in Iowa prior to moving to North Dakota and had been either baptized, confirmed or married at this altar back in Iowa. 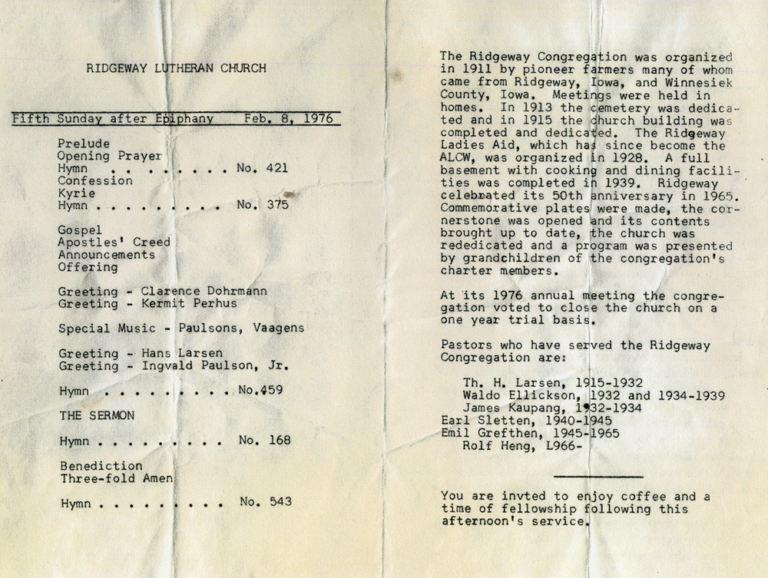 The Ridgeway Lutheran Church also received money from the Madison Congregation near Ridgeway, Iowa. At a church meeting held September 9, 1934, the congregation decided to build a church basement along side the church and to move the church over onto the foundation. The ceremonies of breaking the ground were performed that day by Reverend Waldo Ellickson and the trustees of the church. The cornerstone was laid October 14, 1934. At the annual meeting held on January 11, 1976, the congregation voted to disband the Ridgeway Congregation and the Ridgeway Cemetery Association was formed. The closing service for the church was held on February 8, 1976. The Ridgeway Cemetery Association donated the church building and contents to the Stark County Historical Society, and the building was moved to Prairie Outpost Park in 1981. The Ridgeway Church is available to rent for weddings and other ceremonies. A copy of the bulletin from the last service given at the Church. From the Joachim Regional Museum Collection.